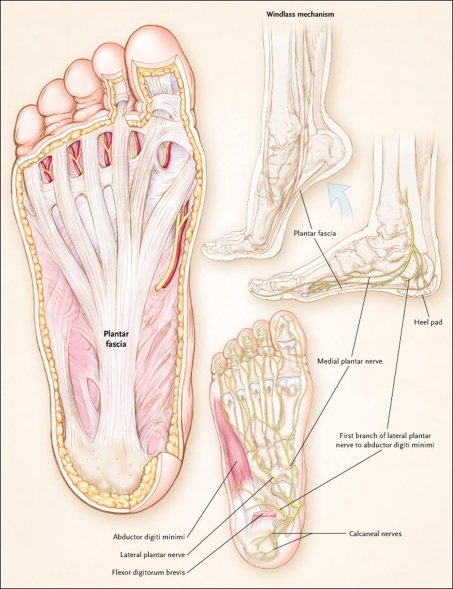 The plantar fascia is a thick, ligamentous connective tissue that runs from the heel bone to the ball of the foot. This strong and tight tissue helps maintain the arch of the foot. It is also one of the major transmitters of weight across the foot as you walk or run. Thus, tremendous stress is placed on the plantar fascia, often leading to plantar fasciitis- a stabbing or burning pain in the heel or arch of the foot. Plantar fasciitis is particularly common in runners. People who are overweight, women who are pregnant and those who wear shoes with inadequate support are also at a higher risk. Prolonged plantar fasciitis frequently leads to heel spurs, a hook of bone that can form on the heel bone. The heel spur itself is not thought to be the primary cause of pain, rather inflammation and irritation of the plantar fascia is the primary problem. 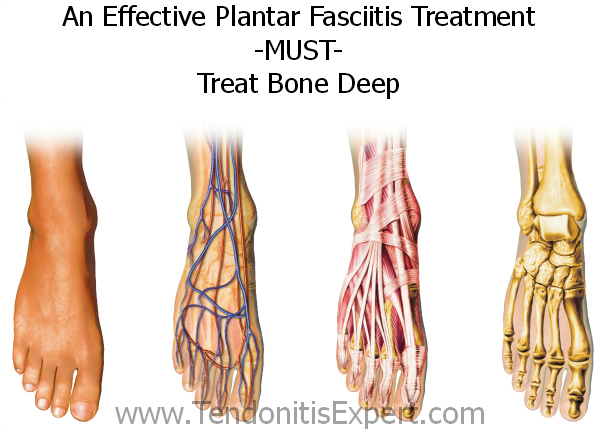 Plantar fasciitis most commonly occurs due to repetitive or prolonged activities placing strain on the plantar fascia. It is often seen in runners, or dancers and gymnasts who perform regular activities involving end of range foot and ankle movements. It may also occur in patients who walk excessively, especially up hills or on uneven surfaces. Older patients who spend a lot of time on their feet may also develop the condition. Plantar fasciitis frequently occurs in association with calf muscle tightness, inappropriate footwear, or biomechanical abnormalities, such as excessive pronation (flat feet) or supination (high arches). Occasionally the condition may occur suddenly due to a high force going through the plantar fascia beyond what it can withstand. This may be due to activities such as a sudden acceleration or a forceful jump. The main symptom of plantar fasciitis is heel pain when you walk. You may also feel pain when you stand and possibly even when you are resting. This pain typically occurs first thing in the morning after you get out of bed, when your foot is placed flat on the floor. The pain occurs because you are stretching the plantar fascia. The pain usually lessens with more walking, but you may have it again after periods of rest. You may feel no pain when you are sleeping because the position of your feet during rest allows the fascia to shorten and relax. About 80% of plantar fasciitis cases resolve spontaneously by 12 months; 5% of patients end up undergoing surgery for plantar fascia release because all conservative measures have failed. For athletes in particular, the slow resolution of plantar fasciitis can be a highly frustrating problem. These individuals should be cautioned not to expect overnight resolution, especially if they have more chronic pain or if they continue their activities. . Generally, the pain resolves with conservative treatment. Although no mortality is associated with this condition, significant morbidity may occur. Patients may experience progressive plantar pain, leading to limping (antalgic gait) and restriction of activities such as walking and running. In addition, changes in weight-bearing patterns resulting from the foot pain may lead to associated secondary injury to the hip and knee joints. Heel pain is the most common musculoskeletal complaint of patients presenting to podiatric practitioners throughout the country. It is well-recognized that subcalcaneal pain syndrome, commonly attributed to plantar fascitis, is a disease entity that is increasing in its incidence, owing partly to the fact that it has a predilection for people between the age of 40 and 60, the largest age segment in our population. Plantar Fasciitis is caused by abnormal pronation of the foot. Contributing factors are obesity, weight gain, jobs that require a lot of walking or standing on hard surfaces, badly worn shoes with little support, and also inactivity. As a result of over-pronation, with every step the Plantar Fascia (band of tissue under the foot) is being stretched, resulting in inflammation, irritation and pain at the attachment of the fascia into the heel bone. In some cases the pain is felt under the foot, in the arch. Continuous pulling of the fascia at the heel bone, eventually may lead to the development of bony growth on the heel. This is called a heel spur. When you’re at rest, such as while sleeping, the Plantar Fascia tightens and shortens. When body weight is rapidly applied to the foot, the Fascia must stretch and quickly lengthen, causing micro-tears in the Fascia. As a result, the foot pain is more severe with your first steps in the morning, or after sitting for a long period. Plantar Fasciitis is more likely to happen if you suffer from over-pronation (flattening of the arch), you stand or walk on hard surfaces, for long periods, you are overweight or pregnant, you have tight calf muscles. If you experience sharp, throbbing or aching heel pain with your first steps out of bed each morning, or when walking throughout the day, you may be suffering from Plantar Fasciitis. This guide will help you to understand the definition, symptoms and causes of this condition and will explore your treatment options for rapid relief from your pain. In general, we start by correcting training errors. This usually requires relative rest, the use of ice after activities, and an evaluation of the patient’s shoes and activities. Next, we try correction of biomechanical factors with a stretching and strengthening program. If the patient still has no improvement, we consider night splints and orthotics. Finally, all other treatment options are considered. Non-steroidal anti-inflammatory medications are considered throughout the treatment course, although we explain to the patient that this medicine is being used primarily for pain control and not to treat the underlying problem. If your Heel Spur feels like a bruise or a dull ache, you may have metatarsalgia People with metatarsalgia will often find that the pain is aggravated by walking in bare feet and on hard floor surfaces. Pain in the ball of your foot can stem from several causes. Ball of foot pain is the pain felt in the ball of foot region. Metatarsalgia is a condition characterized by having pain in ball of foot. The average adult takes about 9,000 steps per day.